Sometimes green living is the furthest thing from my mind when I’m shopping for clothes. (Ooh, and how I used to love to shop for clothes! A couple years ago I dealt with my shopaholic tendencies head-on with a 9-month clothing fast.) When I’m trying to find a new outfit, I focus on what it looks like, how it fits … and, admittedly, the price tag. 1. Shop for natural fibers. Shopping for natural fibers at any store is the most expensive way to green your wardrobe – especially if you’re searching for organic cotton items that aren’t on a sale rack. Regardless of sale prices, choose clothing made of cotton, linen, silk, wool and cashmere. When it comes to wintertime fleece, shop mindfully. Polyester fleece is the relatively new, super comfy material that contributes to a lot of static cling in the dryer. (Think fleece jackets, pajamas, and blankets.) To stay warm with natural fibers, cotton fleece typically is used in sweatshirts. You can also shop for cotton or wool flannel. With consignment stores, your savings depends completely on the store. Are the prices reasonable, or could you find better deals on brand-new clothes? The good news with consignment stores is that they almost always sell clothing that’s like-new or new with tags – and typically very good brands of clothing. ThredUP: ThredUP sells secondhand handbags, clothing and shoes for women and children. By starting your order here, you can get $10 off your first order and a second $10 off when you refer a friend. Twice: Twice sells secondhand handbags, clothing and shoes for women. By starting your order here, you can get $10 off your first order and a second $10 off when you refer a friend. Schoola: Schoola sells secondhand children’s clothing – and donates a portion of each sale to public schools around the U.S. Today is the perfect days to start shopping at Schoola – they’re offering free shipping on all orders. By starting your order here, you can get $15 off your first order and $15 to gift to friends. Similar to consignment stores, most of the clothing is previously worn. Prices may be better, though. Many consignment stores are choosy with the quality of their merchandise – anything goes at thrift stores, though. 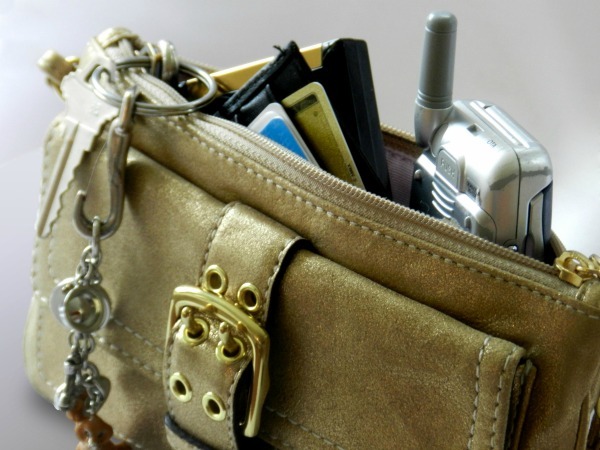 Make sure you examine the clothing carefully for missing buttons, zippers, rips and stains. I’ve found I can typically find amazing bargains at thrift stores. 4. Check out garage sales, yard sales, tag sales and estate sales. 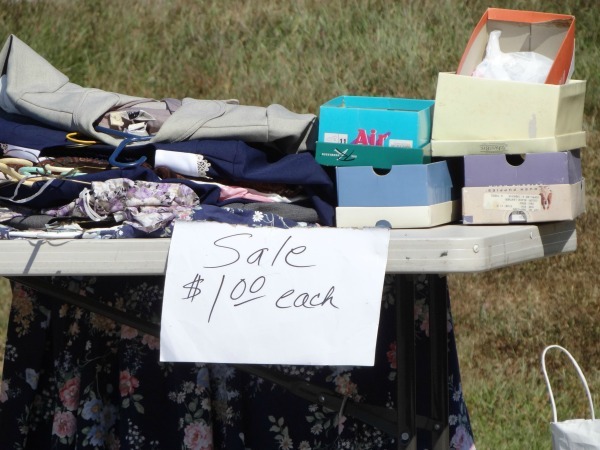 If you enjoy scouring garage sales, you’ll love looking for clothing. Prices widely vary depending on each sale. Know what your spending limits are, and be ready to search – you never know what you might find. 5. Trade clothing with friends. If you and your friends wear similarly sized clothing (or if your children do), plan a clothing swap. It’s a fun way to shop around – for free – for new-to-you outfits in the comfort of your own home. You may have nothing to offer in return, but sometimes people just want to get rid of their clothing. Some of my favorite pieces in my wardrobe have come from generous friends. If you can find some great fitting hand-me-down clothes, be thankful for the wonderful blessing! 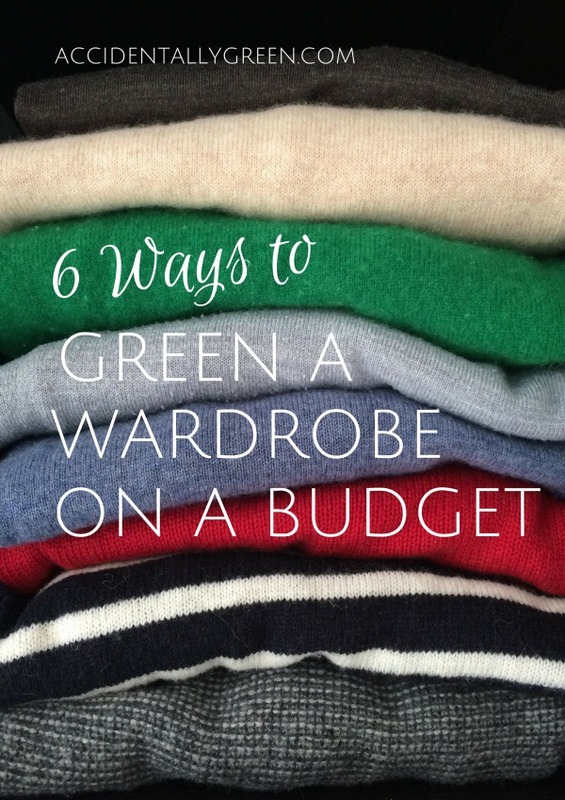 How do you like to green a wardrobe on a budget? Disclosure: Purchasing items through links in this post will result in a commission for Accidentally Green. Thank you for supporting this website! Great tips!! Another thing you can do is simplify your wardrobe and cultivate your own personal style rather than get sucked in by trendy fashion. Going along with trends makes you feel like you need new clothes more frequently. What a GREAT tip, Laura! I don’t buy into too many trends, so I guess I take my strategy for granted, but you are so right. Choosing a timeless style is a fantastic way to simplify your wardrobe.